Pro Yakyuu? Satsujin Jiken! (プロ野球？殺人事件！, lit. Professional baseball? Murder!?) was a parody baseball/murder mystery game developed and published by Capcom for the Famicom near the end of 1988. It was actually published on the same day as one of Capcom's better known titles, Rockman 2 (known outside of Japan as Mega Man 2). Pro Yakyuu? Satsujin Jiken! ("Pro Baseball? Murder Case!") 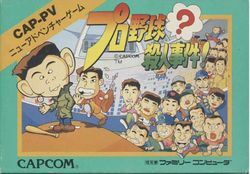 is a parody of the Famicom's overabundance of Portopia style murder mystery adventure games and baseball simulators, particularly the annual Pro Yakyuu Family Stadium releases. The player controls a professional baseball player that's been framed for a murder and must solve the case while on the lam. Capcom inserted various additional modes into the game, such as mini-games and a shoot-em-up sequence whenever the protagonist is caught by the cops. This page was last edited on 1 May 2016, at 03:27.